I figured October was the perfect time for my debut book. 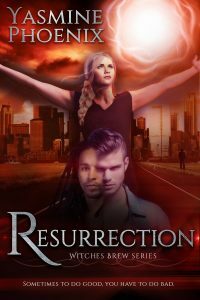 Resurrection, the first in The Witches Brew series, is now available as an ebook at Amazon, iBooks, Kobo. Links are soon coming. I’m really excited to finally get this series started. My heroine, Sophia Sullivan, is a skilled and talented doctor. She’s dedicated her life to the treatment of children. She’s also a powerful and untrained witch. She’s worked hard to keep her two worlds apart. Until one night she’s called upon to stop a witch, devastated over the suicide of her daughter, from opening a portal that separates the dead from the living. If the witch succeeds a witch imprisoned there who tried to destroy Chicago could be released. Now she must decide to either honor her oath as a doctor and save a life or her oath as a witch to protect Chicago even if it means killing the witch. Her decision changes her life and the lives of those she loves. Resurrection asks ‘What if?’ What if you could save a city of 3 plus million by taking the life of one person? What if you could save a person, but it means going against everything you’ve been taught? Sometimes to do good, you have to do bad.